Why do dogs bury bones? The answer to this ubiquitous behavior is as old as canine history. It's a good demonstration of how behaviors can exist centuries after they're no longer necessary for an animal's survival. You've seen it on television and probably in your own backyard. Hey, even Dino did it on the Flintstones and he was just a cartoon dog. A dog gets a bone and immediately begins hunting out the perfect hiding spot. When he finds his chosen locale, he begins digging frantically until he's created a decent-sized hole. Then he drops his treasure in and covers it up without taking the time to truly enjoy it. Burying bones is one of the canine world's more peculiar behaviors, at least on the surface. To understand why we need to look back into their history. Nearly all behaviors dogs display today are rooted in their past. Life in the wild was no picnic for early canines. Food was often hard to come by, and even if a dog was lucky enough to find or capture something to eat, he had to compete with other dogs in his pack to keep his bounty. If other dogs were the only competition, it wouldn't have been quite so bad, but hyenas, jackals, and big cats also wanted a shot at the carcass. If a dog wanted to keep the fruits of his hunting, he had to learn to be crafty. There was usually only time for a quick meal before other animals caught the scent of the kill. So in order to hang onto the food, the dog would need to bury it in the ground and come back later to dig it up again and finish it off. Sometimes the case was just the opposite; hunting was almost too good, and there would simply be too much food to consume in a single sitting. In bountiful times, dogs would still bury bones and carcasses near their lairs. If fresh food suddenly became scarce the dogs could just dig up their old kill, by now naturally "aged," and finish eating it. Hoarding isn't unique to canines. Other denizens of the animal kingdom practice it too. Leopards drag their kill high up in the trees so they can eat at their leisure. Squirrels store their nuts and acorns in a tree hollow or bury them in the ground. Beavers collect piles of vegetation around their lodges in anticipation of the cold hard winter to come. Even people stock their pantries with enough staple to last for weeks. These days, few dogs need to hunt in order to eat. Dog food is as plentiful as the next bag of kibble, and rather than stalking it, it's delivered right to their bowls. You'd think with this kind of wonderful curb service, dogs would no longer feel compelled to bury something for a rainy day. Old habits die hard and this natural instinct still rises to the surface in modern day canines. Not only do they continue to bury bones and food, but they'll also even bury their playthings, and perhaps an item or two belonging to their favorite people. Dogs will bury items all around your house in couches, bedding, and in the laundry if they feel motivated to do so. Think of it as not just an instinctual behavior, but a smart one at that as your dog is planning ahead for the future. Have you ever found bits of kibble in your Toy Poodle's bed and wondered how it got there? Hoarding. Have you looked for your sweater, only to find it wrapped up in your dog's blanket? Hoarding again. The behavior may be modified for today's environment, but it's still in practice. Although some dogs are more compulsive about the behavior, you'll see it to some degree in nearly all canines. There are no "dog breeds that bury bones" compared to other dogs. However, breeds that were bred for hunting may tend to bury bones more because of the hunting instinct that has been bred into them for generations. 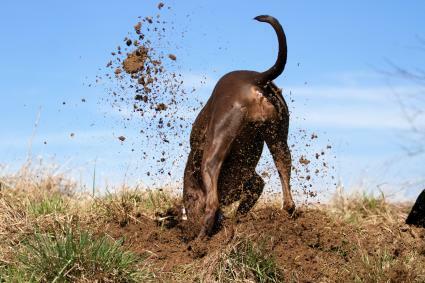 Likewise, dogs that were bred to "go to ground" such as the terrier group and Dachshunds can be more likely to practice this behavior as digging is a heightened behavior for these dogs. Stress and anxiety can sometimes also come into play. Dogs that are feeling nervous may bury items to calm themselves. You may also see more of this behavior in multi-dog households, or among dogs that grew up in situations where they had scarce resources, such as in a puppy mill. Burying behavior among dogs can have some interesting quirks that often leave dog owners scratching their heads in confusion. Why Does a Dog Bury Bones With His Nose? A dog will use his nose to bury bones, food, and toys because it's part of the instinctual behavior of hoarding that has a set pattern. A dog will use his paws to dig a hole, then use a combination of paws, nose and mouth to move the desired object into the hole. Finally, he uses his nose to cover up the area and push the object in to keep it extra safe. Why Does My Dog Hide Bones in my Bed? While you don't like to think of your bed as a pile of dirt, to a dog it's not too different when it comes to hoarding. It's a place where it's easy to hide things, just in this case he can push and dig around blankets rather than earth and leaves. It's also a nice comfy spot, so once he's properly "buried" his prize, he can curl up on top of it to keep it safe while taking a nap. If you're also wondering, "Why does my dog bury bones under me?" it's basically the same reason. You can even feel a bit special knowing your dog considers you a safe place to bury his treasure. Why Does My Dog Bury His Rawhide? A dog's hoarding behavior is not just limited to bones. Dogs will bury any sort of "high value" item which includes not only bones but rawhides, antlers, dog chews, kibble, and even toys. 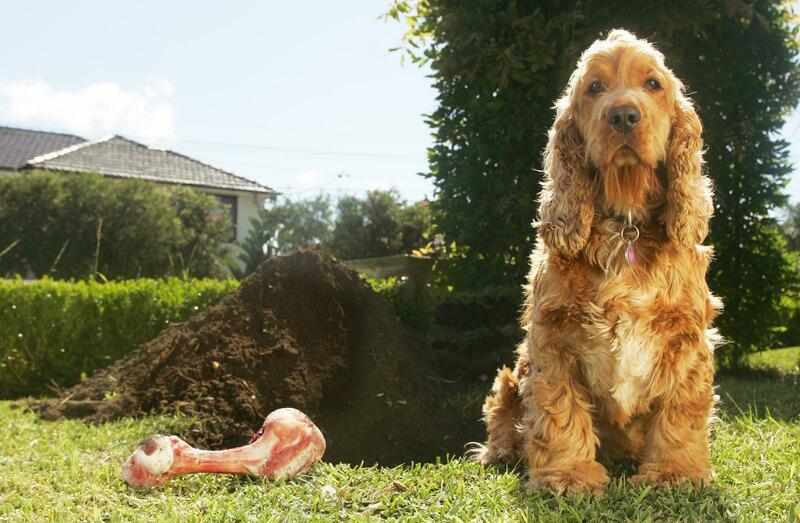 Can My Dog Remember Where He Buried His Bone? The answer is, "it depends." If your dog is a prolific, serial hoarder, he may forget over time where he has buried items, especially if he has a large area to cover. This is especially true for objects that he may not have a scent trail on, such as a toy. However, bones and other food items should be easy for your dog to find, even if he may not "remember" specifically where he put them. This is due to a dog's strong sense of smell, so he may not remember where he put them but he's sure to find them if he just uses his nose. Dogs Will Bury Bones... and More! So now you know the answer to the question "Why do dogs bury bones?" Old Mother Hubbard's cupboard aside, it's simply a natural survival instinct dogs developed to fend off starvation. The next time you see your pet raking up the garden with his new rawhide clutched between his teeth, try not to be angry with him for ruining the begonias. It's hard to fight more than a thousand years of canine instinct and history.